In the next few minutes, I'm going to be closing my computer and leaving the International Conference Centre in Durban, with no plans of ever coming back. The negotiations won't officially be over, I won't know if there is an agrement on a second phase of the Kyoto Protocol, I won't know if governments have committed to "operationalizing the GCF under the stweardhsip of the GEF." Going into these talks, I've come to realize, it was going to take a miracle for something resembling an adequate agreement to come out. This was especialy true after the dissapointment of Copenhagen and the non-starter of Cancun. The idea of a second phase of the Kyoto Protocol was already being dragged through the mud, not the least by our own Canadian government and our environment minister Peter Kent. But while most attention was on Kyoto, the underlying problems of how we have been addressing climate change were allowed to once again slip through unnoticed. Have a conversation with an environmental organization based in a southern or small island country, or one whose members are indigenous people, or take a visit to the Univeristy of Kwazulu Natal where grassroots organizations from across Africa and around the world were meeting, and the picture became clear: so long as we base our attempts to fight climate change on for-profit solutions, and not on rethinking how we consume fossil fuels, produce food and buy up consumer goods, we condemn the world to a future of warming temperatures and extreme weather catastrophes. 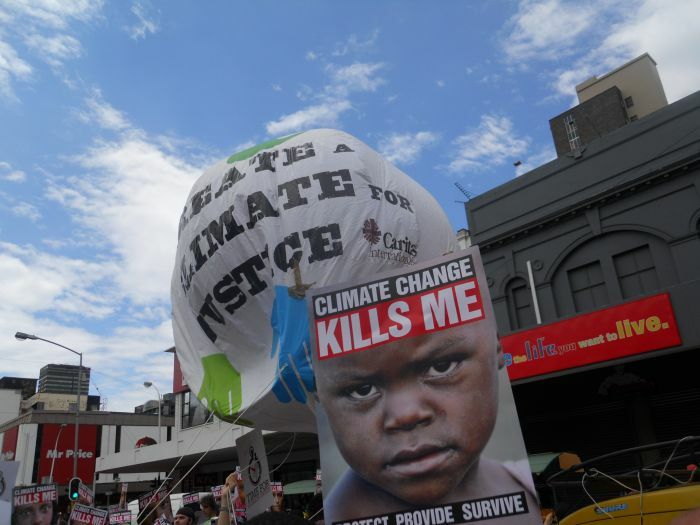 Many have heralded the Green Climate Fund, which could provide up to $100 billion to projects that would either help comunities adapt to or mitigate the effects of climate change, if it were to be finalised here in Durban. But under the interim trusteeship of the World Bank, studies have already shown that the money it has disbursed, along with similar projects like it, have done little to help where is it needed most. Instead, the result is funding offsets so that dirty industires, like coal, that we must limit and eventually do away with, can continue to produce. The same goes for REDD: Reducing Emissions from Reforestation and Forest Degradation. On paper, the idea of financing projects to protect or replant trees around the world makes a lot of sense. But in its current implementation - and in the proposed REDD+ that would include agriculture and soil carbon - the results being reported are much the same as the GCF: so long as the idea is to partner with private, for profit interests and not with the local communities fighting climate change impacts, the solutions do not go far enough. A rallying cry which has periodically appeared throughout this conference has been Occupy COP17. I'm hesitant to jump on the Occupy bandwagon here, especially because it trasplants an action predominantly coming form North America (in its current form) to struggles around the world. But if you believe that the ethos of the Occupy movement is that we cannot solve our current problems of societal inequalities without addressing the fact that a few players control a large amount of money, and with it a large amount of power, then it can easily be applied to the halls of the ICC as well. So long as richer countries and large private corporations - and not just oil and coal companies, but large investment firms who hope to make back the money they have already lost on the crumbling carbon market or see a goldmine in food price speculaton - look more to the bottomline than to the rising mercury, we won't have a solution. Another rallying cry has been "Don't let Africa cook," which may seem extreme, but is a real possibility over the next ten years if we don't see immediate action. Average temperatures are already rising, extreme weather is accelarating in frequency, and famines are increasing. The impacts of climate change are no longer 50, 30, 20 years in the future; they are in the next decade. I didn't come to Durban with rose-colored glasses, but I still held out hope that progress could be made. As the hours drag on, any such faith has evaporated (in fact, it had pretty much evaporated in the first few days of the first week). Instead, we need to heed the words coming from groups like Climate Justice Now to instead turn to the streets in our capitals, to turn to our neighbours back at home, and organize even more from the bottom up. We need to see that the disregard for people's well-being - whether it be housig foreclosures, cuts to basic public services, or the continued emission of toxic fumes and destruction of land - is linked together. Because there is a "1%" at the top, and they are comfortable there, and they won't move at all unless we push them. Submitted by Jadis on Sat, 12/10/2011 - 13:52.
bien dit, Tim. meme que l'energie emise pour creer une telle conference pourrait, a elle seule, commencer a resoudre de facon signifiante les enjeux relatifs a notre negligeance envers des pays en developpement.